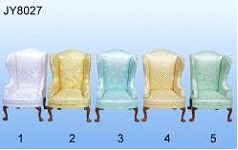 This light Green Wingback Chair is used for 1" scale or 1:12 dollhouse or miniature room box. This Wingback Chair is from Hansson. Hansson miniature furniture are considered to be of museum display quality. Every piece is beautifully hand carved and hand painted, with upholstered seats, working drawers and many magnificent details. This is a collectible item for miniature dollhouse. It is NOT meant for young children!